Atlanta Vinyl Windows is a family-owned, and owner-operated vinyl window replacement company. At Atlanta Vinyl Windows, we believe that Atlanta Window Companies should provide the best quality, service and energy products in the industry. We place the most importance in honesty, integrity, and affordability. We don’t pressure homeowners, we educate. We work hard to maintain a good reputation. Because we are affordable doesn’t mean we don’t give top quality service or provide top quality products. We choose not to participate in gimmicks, and we don’t have a fancy showroom. This allows us to pass savings down to our customers. 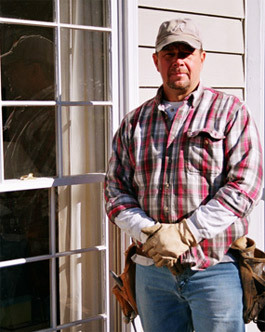 I install every window myself, I also don’t hire sales people to pressure homeowners. I complete every estimate myself, and evaluate each homeowners needs. This is a huge savings for every homeowner. There is no hidden sales fees in our estimates. Jeff was raised in Syracuse, New York. He moved to Woodstock, Georgia in 1987. He has been in the construction industry since 1981. He is one of those people that you like immediately, he is admired by many due to the fact that he is very trustworthy. He is a devoted father, and husband. His hobbies are duck-hunting, fly-fishing, Atlanta Braves, and carpentry. Our work is guaranteed. My top priority is to get your referral, if you’re not happy then I’m not happy. That is why I make sure to do every install myself. We have a word of mouth customer base that insures that our handshake is our word.